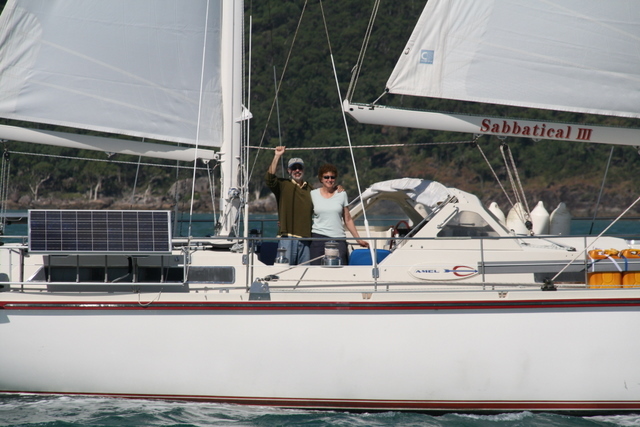 We sailed about 2,174 nautical miles over 57 days. Total of 334 hours of sailing at an average speed of 6.5 knots (7.5 mph). We dropped anchor at 24 different bays and harbors (including 3 marinas) – with time spent on shore hiking and sightseeing at 13 of these. We only swam and snorkeled at two places due to the abundance of crocodiles and lack of clear water in most places. The” Great Barrier Reef” did not live up to its reputation and we have started referring to it as “The Pretty Good Barrier Reef”. Maybe it was just a bad year here due to a big cyclone and lots of rain earlier in the season. Maybe we are just spoiled after 4 years of snorkeling in so many unspoiled islands across the Pacific. 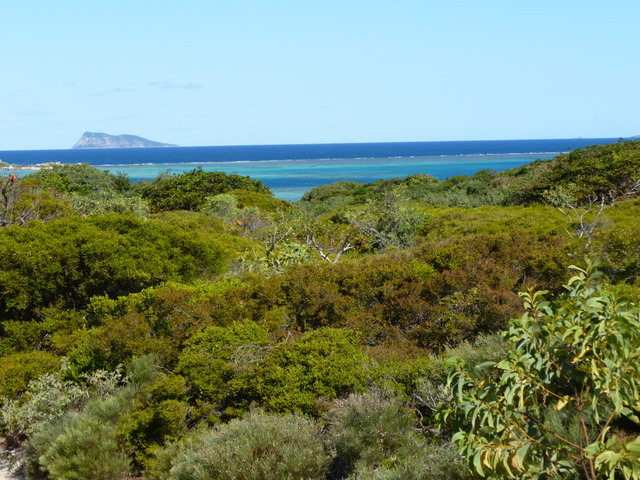 In any event, despite our inability to get in the water, most of the coast of Australia was very interesting to see; almost totally uninhabited with mile after mile of beaches, sand dunes, scraggly trees and some pretty impressive hills. 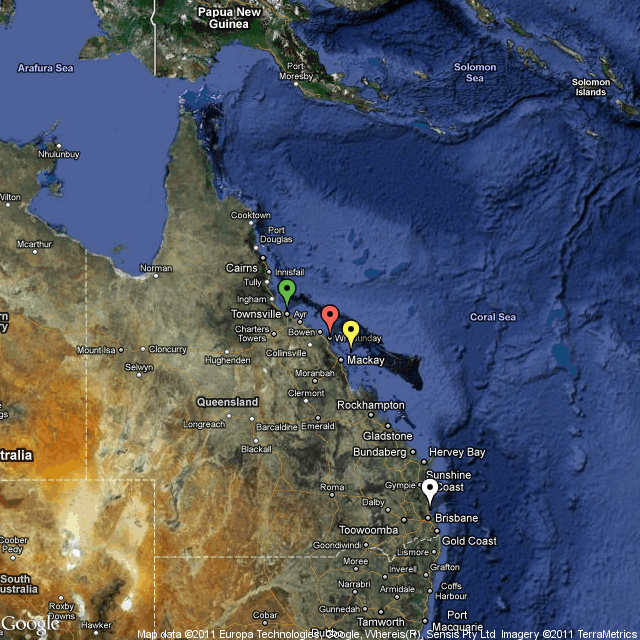 Just a few towns here and there with lots of miles of land off limits to all but the Aborigines. We had some of the best sailing of our trip because the barrier reef cuts off most of the ocean swell so that one can sail along on smooth seas and there are steady trade-winds pushing you along in the right direction. Great fishing as well. Looking forward to spending the next 3 weeks here in Darwin – enjoying the luxuries of living at a marina – unlimited power for lights and fridges, easy access to stores, and lots of opportunities to walk and visit with other sailers. We arrived in Darwin this afternoon, seven weeks after we left Scarborough Marina. We encountered no stormy weather or drama, yet the almost daily routine of having to pick up anchor and get to the next anchoring place before dark became exhausting by the end. The sun has been intense during the day, and it has warmed up considerably. 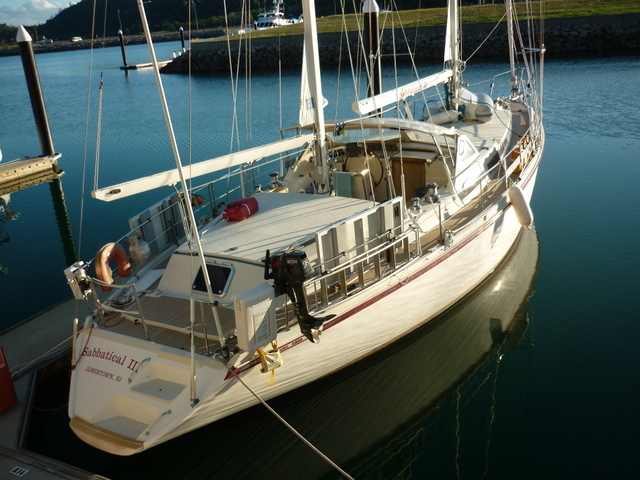 But now we have three weeks to get Sabbatical III ready for her voyage through Indonesia. We will write more tomorrow to update the blog with the events of the past week. It is great to he here. We left Marchinbar Island in the Wessel Islands yesterday at first light and sailed 240 miles in about 32 hours to Oxley Island. Oxley is uninhabited, as is Marchinbar, and lies about 20 miles from the larger Crocker Island. The sailing was very good. We sailed with “Endangered Species” and “Dadelus”. Only Dadelus is here with us now as Endangered Species continued on to Crocker Island. Tomorrow we will sail 50 miles to Port Essington on the mainland coast.M. We arrived safely at Two Island Bay, Marchinbar Island, Wessel Islands, Australia this afternoon. We will write about the passage tomorrow after we catch up on sleep. The last time we anchored this far north was the Galapagos Islands. This is, of course, the farthest west Sabbatical III has ever been. Yesterday we sailed in 20-25 knots winds that pushed the boat along at 8 to 8.5 knots. Three freighters passed us in the channel during the sail in what seemed to be slow motion. There seems to be a 14 knot speed limit in the channel along the Great Barrier Reef, so a freighter going north (which is all we saw) only closes on us at 6 knots or less. Our AIS makes us aware of then more than 20 miles away, and tells us that they will approach us in 3 hours. In three hours we can have lunch, take a nap, and then deal with freighter traffic. If only it was this way all the time with freighters. The wind, seas, and currents are all perfect for our departure across the Gulf of Carpenteria starting tomorrow morning (June 19). We will leave here (Mt. Adolphus) at about 0930 local time and catch the strong tidal steam as it turns to the west along our various legs through the Torres Strait, following the Prince of Wales Channel. It is 361 nautical miles to Two Island Bay in Marchinbar Island. The course is about 265 degrees magnetic once we clear the Straits. The forecast is for winds of 15-20 knots from the southeast andd seas less than 2 meters for the whole trip to Marchinbar. The attached map shows where we have been where we are, and where we are going. The yellow icon is Scarborough (Redcliffe), our starting point this year, the green icon is Mount Adolphus Island, our current position, the white icon is Marchinbar Island in the Wessel Islands, our next stop, and the red icon is Darwin, our last stop in Australia. In anchoring at our current location (Margaret Bay), Sabbatical III is further north (by latitude) than she has been since June 2007 when we were in Oa Pou in the Marquesas Islands when Hannah and Mia were visiting us. Even though we are so much closer to the equator, it is still cool at night and even on the water sailing during the day. We have been told that Darwin is, unfortunately, a bit steamy. We sailed to Margaret Bay (behind Cape Grenville) yesterday (Wednesday) in brisk winds and somewhat confused seas. It was a fast sail. We decided to spend the day here today and rest and plan our next passages. Some other Rally boats came in today and Laura joined them for a walk ashore while I worked on issues of tides, currents, and winds. There was a small (8 foot) crocodile on the far end of the beach, so Laura and her companions walked the other way. The usual course from here is to sail to Escape River (80 miles north) and anchor, and then proceed around the tip of Cape York the next day via the Albany Channel, ending up at Seisa. However, it would be dead low tide when we arrived at Escape River, made very low by the full moon, and we have had a friend who recently went aground there. I do not want to enter the river at anything less than half tide. Moreover, the next day it would be difficult to avoid an adverse current in the Albany Channel. So we now have a different plan. 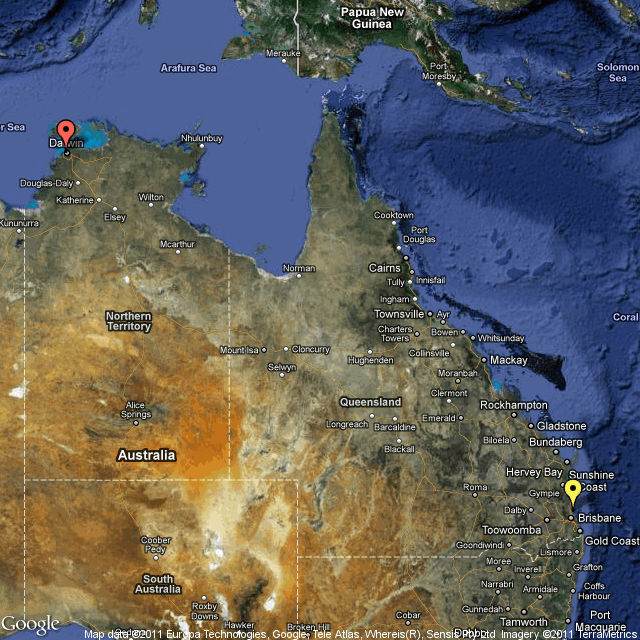 We will leave here at 3:30 am and head for Mount Adolphus Island going outside of Albany and north of Cape York. That is a passage of 90 miles. The bay on the west side of Mount Adolphus looks like it would be secure. 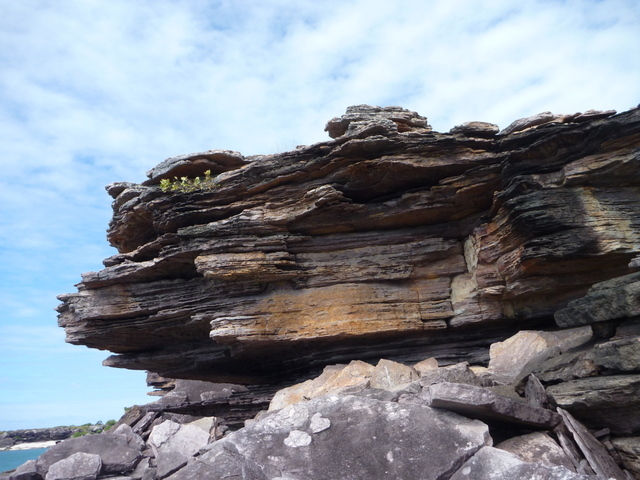 Cape York is the northern most point of continental Australia. After a day of rest, we plan to sail well north of Cape York and take the Prince of Wales Channel through the Torres Strait and on to Marchinbar Island at the north end of the Wessel Islands. This latter passage is about 360 miles and will take 48-56 hours depending on conditions. Our friends on “Wombat of Sydney” anchored at Two Island Bay at Marchinbar Island last night and said it was very secure and provided me with lat-long and entry info. 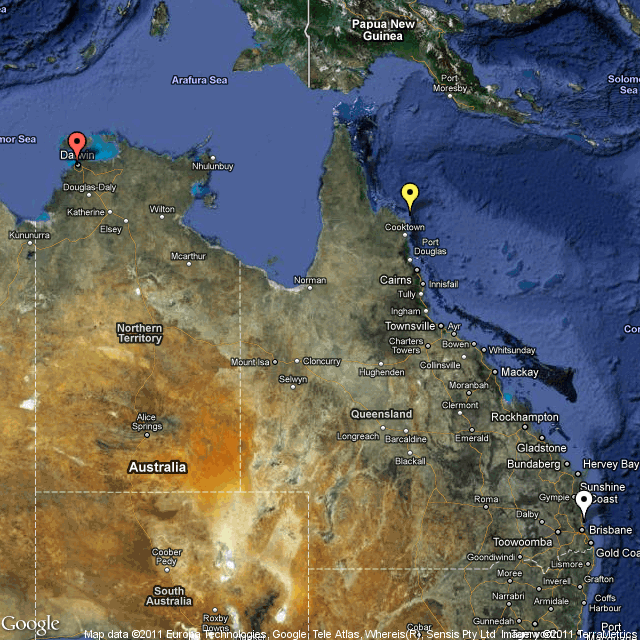 From the Wessel Islands we will plan the rest of our journey to Darwin, which will then be just a few days more away. In going from Mount Adolphus to the Wessel Islands we are crossing the Gulf of Carpenteria, or as some sailors call it, the Gulf of Crap-iteria because of the uncomfortable sea conditions that are common. Looking ahead, we see a weather window of somewhat better seas starting on Sunday so we hope to cross the Gulf on Sunday and Monday and arrive at the Wessels on Tuesday morning. We will try to post an update from (uninhabited) Mount Adolphus Island. Yesterday we sailed the 80 miles from Eagle Island to Flinders Island. When we left at 4 am, we noticed that the wind was down from the 18-21 knots of the previous four days to 15 knots. The forecast called for 20 25 knots The 15 knots gave us a good sail until around noon and then the wind just died, and we had to motor the rest of the way to Flinders. The bright spot was the King Mackerel that I caught in the afternoon. Enough nice, white fish for supper for four days. The wind came up at 1 am this morning. We know since it generated a steep chop in the anchorage that hit the boat at the stern (wind and current were not from the same direction). Nothing to be done but try to sleep as well as we could as the boat pitched around. We left at 7 am for Morris Island, about 60 miles away. We were able to sail for the first 6 hours but then the wind died again and we had to motor for 3 hours before we got a little breeze again. On the bright side, the seas were quite flat except for those hours at anchor. There are five other Sail Indonesia Rally boats here (one US, one Canada, one Brazil, one France, and one Australia) and I expect all will head for the same place we will head tomorrow — Portland Roads. But if the wind is too light, I think we may just wait another day at anchor. We are still at Eagle Island. Yesterday the smoke from the fires on Lizard Island diminished and the boats that were with us either returned to Lizard Island, or continued north. We were going to continue north today as well. But I got on a Skype session with a professional colleague (we still have access to 3G from Lizard) about our research collaboration, and the day went by without us getting prepared. So we decided to stay here another day. We were able to snorkel in three different places on the reef around Eagle Island and it was quite nice, although a bit on the cool side. The highlight is the giant clams. The biggest are 3 feet (1 meters) across and about 2 feet (0.6 meter) tall, and must weigh a couple of hundred pounds. That is a lot of clam. They are the largest bivalve mollusks in the world. The color of their lips vary from clam to clam. 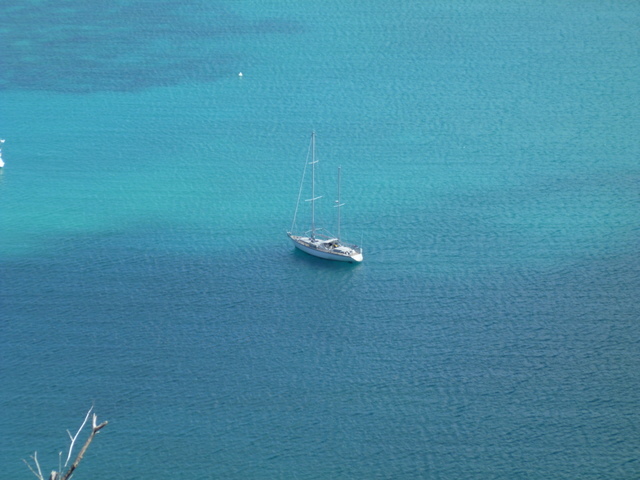 Below is a photo we took of a smallish one that was just below were we anchored the dinghy. We are planning to leave for the Flinders Islands tomorrow (Saturday) morning at 0400. It is about an 80 nautical mile sail. There is no shortage of wind this week. It is unlikely that we will have internet access for the next week, but we cannot know until we get there. We will continue to day sail up the coast until we round Cape York and move away from the Great Barrier Reef. We were expecting to spend a few more days in Lizard Island, as were almost a dozen boats at anchor there, until two National Park Rangers came by the day before yesterday to tell us that they were going to start a controlled burn of brush and grass the next day and that we should strongly consider leaving. That was a bolt out of the blue. Yesterday morning early, quite a few boats left for the longish passage to the next secure anchorage, Flinders Island, about 75 miles away. About 6 boats decided to stay and see how much smoke and ash there would be. Sabbatical III left to try anchoring behind tiny Eagle Islet about 5 miles away. We were prepared to sail on if we could not find secure anchorage there. With Laura up in the mast to look for coral and rocks, we anchored fairly comfortably in uncharted waters. This morning, the second days of fires at Lizard, five other boats came over to join us after we told them that Eagle Islet was a decent anchorage and the smoke and ash at Lizard became worse. 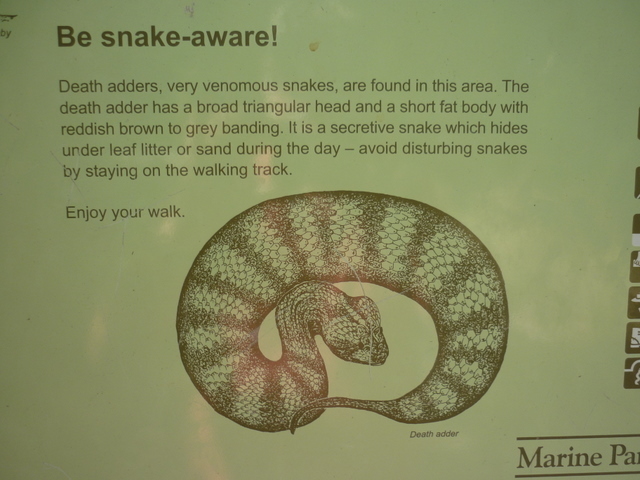 At least we had the opportunity to hike the two best trails at Lizard. The newly arrived boats did not hike at all and the trails are closed for 4 more days. We arrived at Lizard Island yesterday (Saturday) morning after a great 23 hour sail from Cairns. The wind was very light for the first hours but then came up and stayed 12-15 knots throughout the night. The Great Barrier Reef, which is really a set of discrete coral reefs, is quite close to the mainland this far north in Australia. As a consequence, the seas are quite calm inside the reef. So calm, that Laura slept in the forward berth while off watch during the night — the first time we had done that since we left the US. The forward berth is the most bouncy and loud place on the boat while underway. The drawback to the proximity of the Great Barrier Reef to the mainland is that we have to sail a zigzag course avoiding numerous reefs. As a matter of safety, we had never sailed among reefs at night, until for the trip to Lizard Island. The Australian nautical charts are spot-on and as long as we kept aware of our position, we knew we would be OK. We sailed right by Endeavor Reef where Captain Cook and his vessel “Endeavor” was almost lost in 1770 soon after he “discovered” Australia for England. It was only by heroic effort that “Endeavor” was freed from the reef and repaired to continue it’s voyage home. If it had not, Australia would likely have become French. 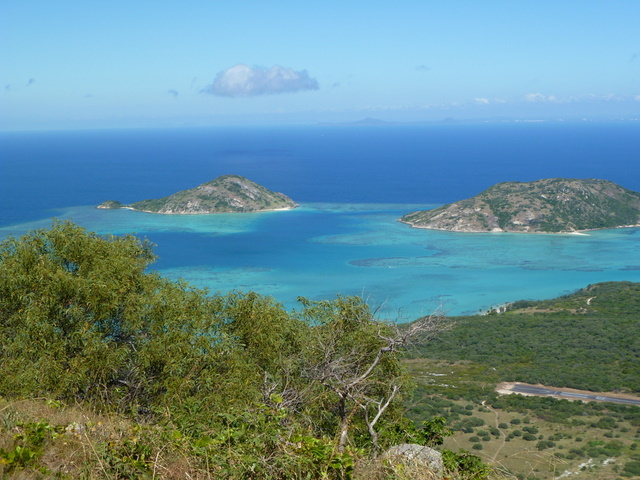 After repairing his vessel at Cape Tribulation, Captain Cook looked for a way out of the Great Barrier Reef and so he sailed to Lizard Island where he could see a high hill/mountain in the distance. 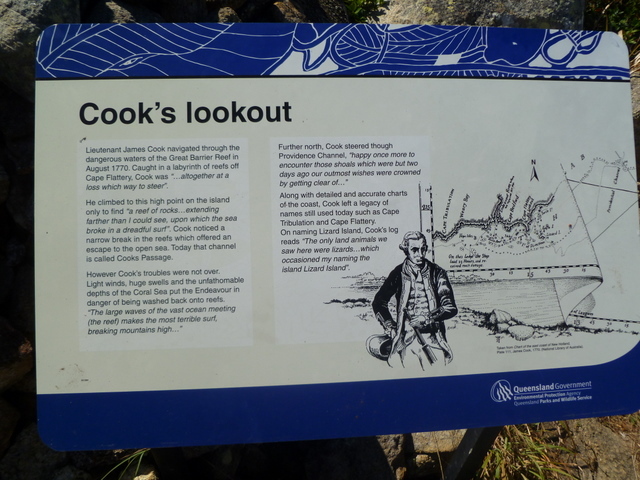 By climbing this hill, which provides a sweeping view up and down the reef, Cook found a way out to the open ocean. So today, accompanied by Mike and Lynn of “Wombat of Sydney” we climbed to Cook’s Lookout. It was an arduous 90 minutes climb to the top but the views were spectacular. 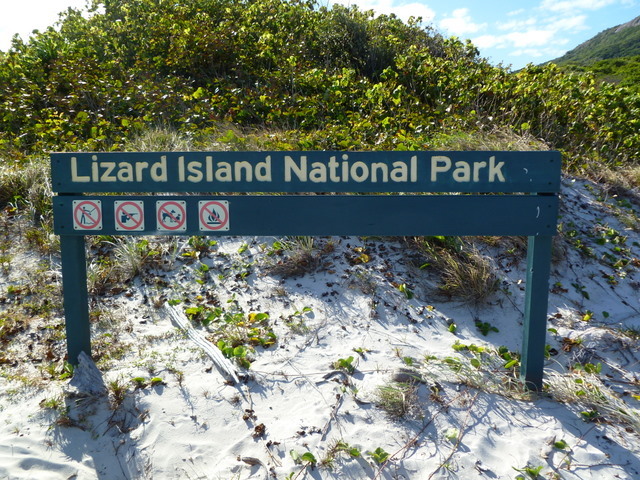 Lizard Island is mostly a national park but there is a very expensive (AUD$1100 per night) resort on the island, and a marine research station. It is the most secure anchorage around and is (almost always) crocodile free, so it is a must stop for sail boats heading to Darwin. There are seven boats in the anchorage at Watson’s Bay on the west side of the island. One advantage of having a resort on the island is that there is 3G cellular service. That allows us to connect to the internet using our USB dongle modem. Once we leave Lizard Island there will be no internet access until we arrive at Darwin around July 1. The trip here from Cairns was easy enough that we still had the energy to set up the dinghy and go to shore and have a hike to the “Blue Lagoon” right after we arrived yesterday. The Blue Lagoon is a reef coral atoll abutting the southwest corner of the island. Not a good place to anchor in most weather, but worth a hike across the island to see. The resort opens their beach bar to yachties on Friday and Sunday night, so almost everyone at anchor came ashore this evening for drinks and fish and chips at reasonable prices. 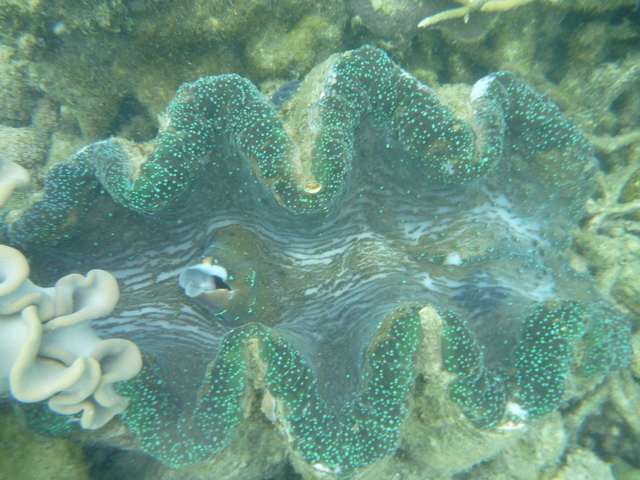 Tomorrow we will snorkel the nearby reef which contains many giant clams that are each a few feet across and very colorful. We plan to spend a few days more here before moving on. We have about 1200 nautical miles left to sail until we reach Darwin, so we cannot linger for too long. 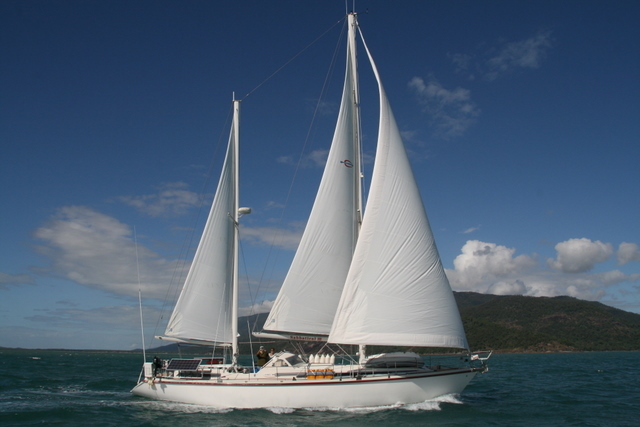 We will leave Cairns late in the morning (Friday) heading for Lizard Island, about 140 nautical miles to the northwest. 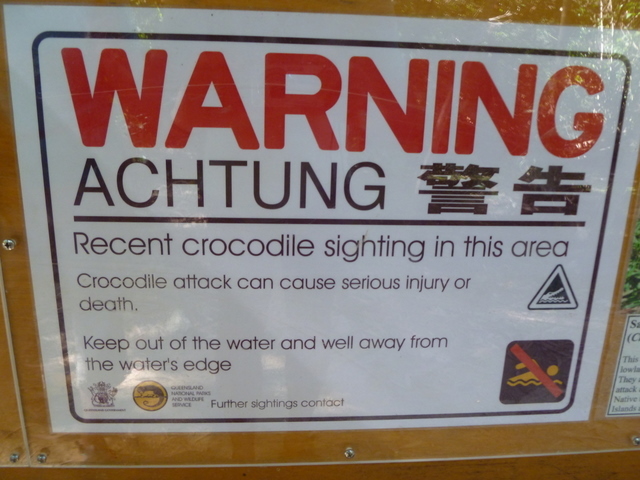 It is supposed to be a beautiful place where one can actually swim without worrying too much about crocodiles. We have not been in the water yet this year. First, it has been surprisingly cold for the season — down into the high 50’s at night. Second, the floods of the first months of the year led to large quantities of silt washing into the sea, reducing visibility. Third, Cyclone Yasi, which hit northern Queensland a few months ago, also stirred up the water and killed large areas of coral on the Great Barrier Reef. Friends who are currently at Lizard Island have communicated to us that the water is clear and the coral healthy there. Today we went to the botanical gardens and strolled the boardwalk at sunset to watch the lorikeets congregate. The photo below is of the public pool where Laura has gone to swim at 7 am in the morning when it is still (relatively) frigid. At that time she can do laps. The second photo tells you why everyone swims in the large public pool, and not in the ocean. We arrived at the Marlin Marina in Cairns on Sunday after a short sail from Fitzroy Island. The marina is part of a large waterfront tourist development with a boardwalk, nice hotels (including a Hilton), restaurants and shops, and a large swimming pool (you do not want to swim in the ocean with all the nasty creatures that inhabit these waters). More importantly, there is a “Woolies” (Woolworth’s) supermarket just two blocks away. As we left Fitzroy Island, we saw “Wombat of Sydney” just behind us after an overnight sail from Magnetic Island. We thank them for these beautiful pictures of Sabbatical III underway. In the marina we have run into lots of boats that we know from last year and even before, plus we have made many new friends. Most of these boats are heading for Darwin, as we are, and about half will proceed to Indonesia at the same time we will. The rest are heading for South Africa. There are five Amel’s heading for Indonesia on the Rally — two French, one Swiss, and one English boat, in addition to Sabbatical III. In all, 93 boats are now registered for the Sail Indonesia Rally. Video: Catching a small mahi-mahi in the way. We left Magnetic Island yesterday heading for Cairns via the Hinchinbrook Channel. 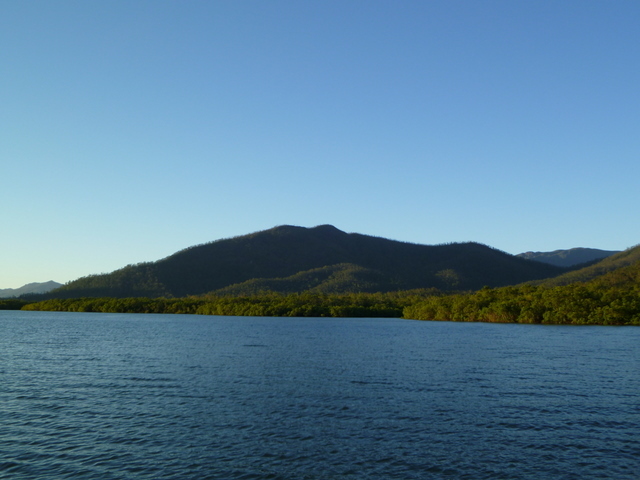 The Hinchinbrook Channel is a relatively narrow strait between the mainland and the high island of Hinchinbrook, which is a national park. It took most of the day to get to the channel entrance where it is quite shallow at the entrance bar. We anchored 10 miles up the channel in a beautiful sheltered spot. Today we went up the remainder of the channel (about 20 miles) and then across to Dunk Island, where we are now anchored for the night. Tomorrow we will continue north to Fitzroy Island and then arrive in Cairns the next day (Sunday). We spent much of our last day in Magnetic Island with Mike and Lynn of “Wombat of Sydney.” Wombat was with us at Huon and Chesterfield Reef last year, and we have known them since French Polynesia. 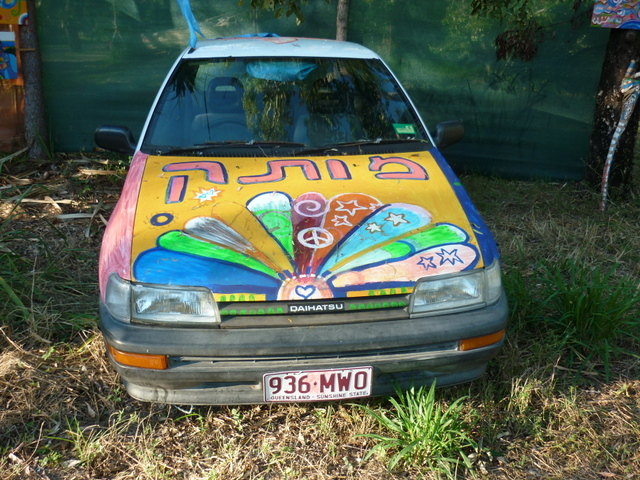 They are also heading to Darwin. 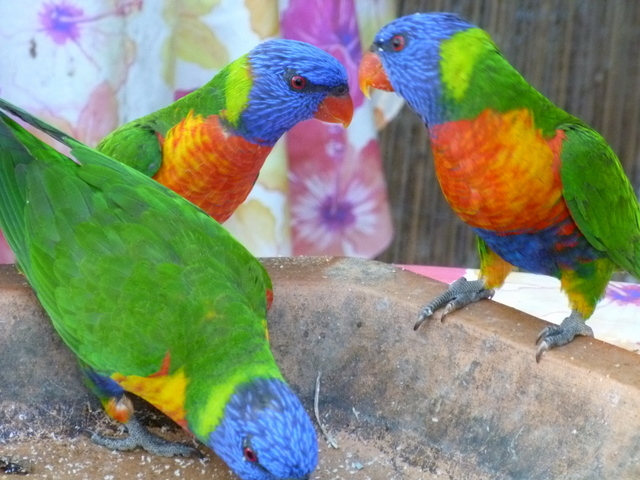 We will likely see them again in Cairns in a few days. 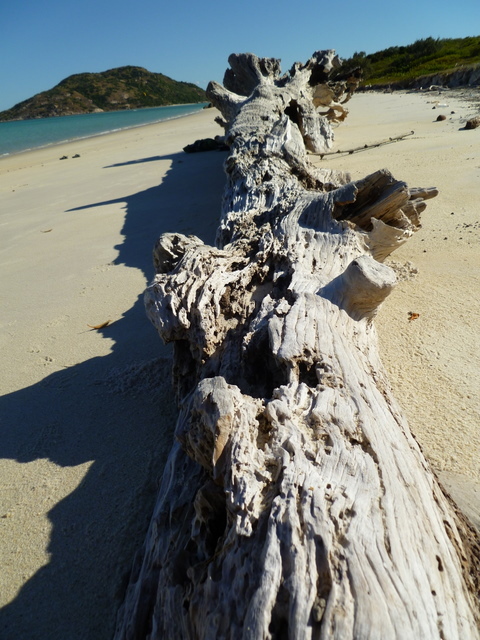 Magnetic Island has turned out to be a place that we have really enjoyed. The marina is quiet and inexpensive with an excellent restaurant and an IGA supermarket next door. By staying three days in the marina (which is small and practically empty), we received a $50 coupon for dinner at the restaurant and a $25 coupon for wine with dinner. The meal we ordered was delicious and elegantly served, and so was the wine. With the coupon the meal was practically free. There are great walks on the island, and a bus to take you to trail heads. 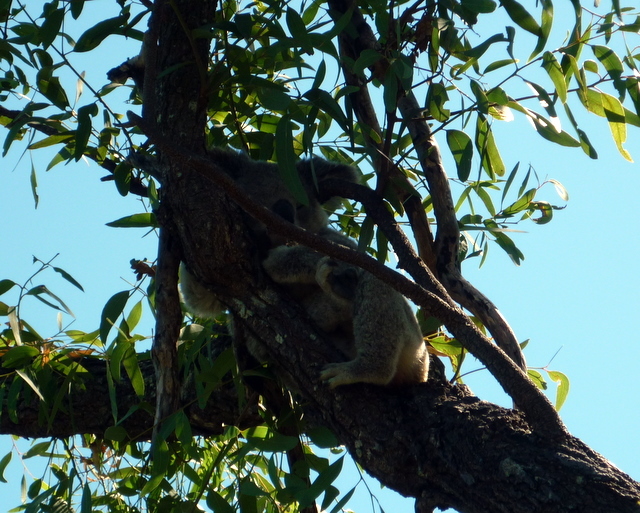 There is also wildlife to be seen — rock wallabies live on the breakwater, koalas in the trees (see photo below), and death adders, one of the most poisonous snakes in the world, crawl in the bush. 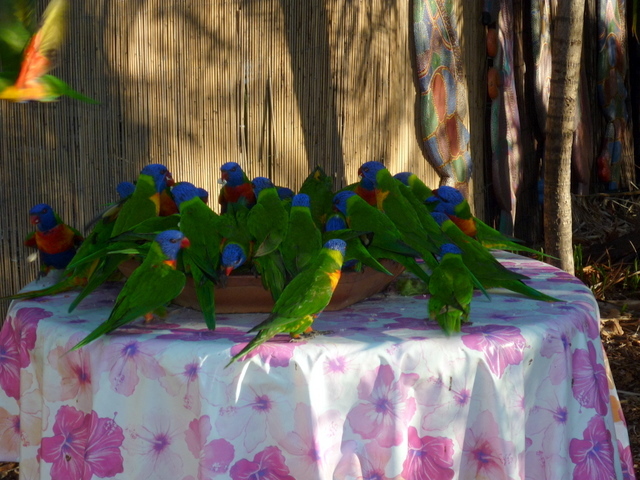 There are beautiful and strange bird calls day and night even in the marina, and flocks of parrots fly from tree to tree. — M.
We left Airlie Beach yesterday around midday for an overnight sail to Magnetic Island, just opposite Townsville. We had good wind the whole way. One-half of Magnetic Island is part of the Great Barrier Reef National Park. The other half is a commercial tourist development with souvenir shops, jet ski rentals, and expensive eateries. This map reflects our progress to date. 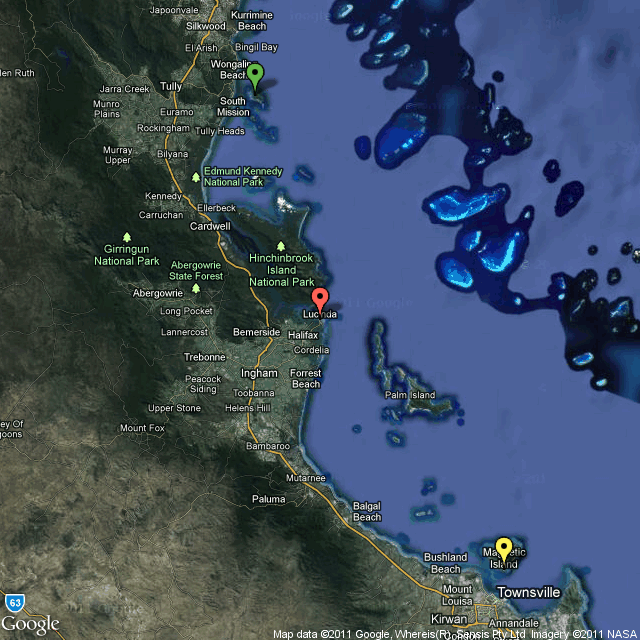 The white icon is Scarborough, where we started, the yellow icon is Scawfell Island in the southern Whitsunday Islands where we hid from bad weather for five days, the red icon is Airlie Beach, and the green icon is Magnetic Island. The dark patch off to the east of the icons is the Great Barrier Reef. We still have a long way to go to get to Darwin. 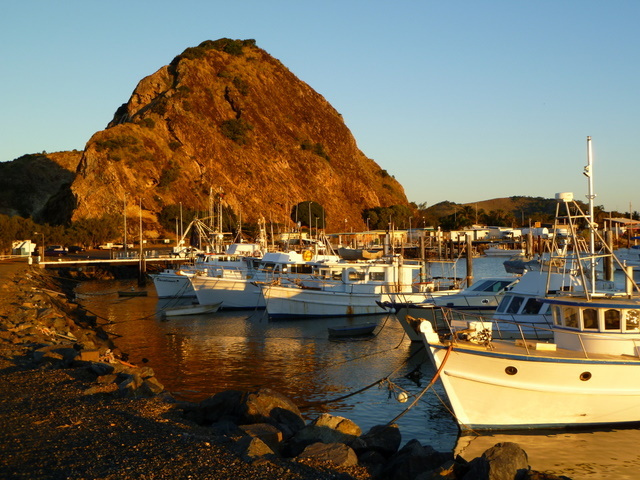 The photo below is of the fishing harbor in Rosslyn Bay where we spent two nights. We suddenly found ourselves with no means of posting the blog after leaving Rossyln Bay – so nearly a week has passed since we wrote about the crocodiles. After leaving Rossyln Bay we sailed to two other anchorages in quick succession – both of them about 8 hour sails. We wanted to continue to make progress up the coast, but still tie up in a comfortable anchorage to sleep at night. 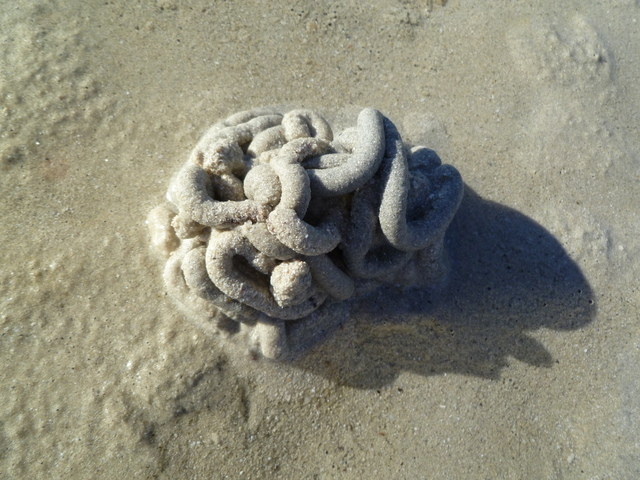 (The bays were called Pearl Bay and Middle Island of the Percy Isles for the record) . We ended up doing quite a bit of motoring as the winds were light and the weather was fine – really beautiful, but not that good for sailing. We started seeing very high winds and seas coming up in the forecast so we made our way to Scawfell Island which is a fairly big island with huge hills that surround a very large and supposedly comfortable and well protected bay. We ended up spending a very long 5 nights at Scawfell. After we arrived the wind and seas both picked up and there were “wind warnings” out over the marine radio. The hills protected us from the high seas, but the winds seemed to accelerate as they came over the hills and into the bay, and between the high winds and huge tides, the boat was very uncomfortable for a lot of the time–rolling and bobbing around almost as bad as being at sea. The wind was whistling and screaming through the rigging constantly and it really started to get on our nerves. There ended up being 7 boats in the anchorage and no-one left their boats at all (except for one evening). We felt a bit trapped, not able to go to land and walk on the pretty beach or even visit with anyone else except by radio. Oh well, today the winds finally let up a bit and we finally left (as did all the other boats) and we had the most beautiful sail up to our next anchorage. Great wind and we sailed through the long beautiful islands of the Whitsunday’s where both winds and currents were going our way which gave us an incredibly smooth and fast ride. We felt like we were just skimming the surface of the water – just gliding over the seas – and yet going at 9 knots of speed – pretty much as fast as we ever go. . Just wish we had left Scawfell a few days earlier and sailed here. How much scrabble can you play? May 10, 2011: Crocodile Dundee lives! We met an Aussie today – a nice guy named Sean who gave us some important advice regarding fishing and crocs which we wanted to pass on to you – BECAUSE YOU NEVER KNOW when you might need it. 1.) The big ones are old and that means that they grew up when it was legal to shoot crocodiles – and apparently they are smart enough to associate the sound of an outboard motor (on your dinghy) with the memory of being shot at in their youth – and so, Sean tells us, as long as you are running your engine they won’t bother you. 2.) The smaller ones who don’t remember being shot at will probably be curious about you but also will be afraid of the sound of an engine and so they too should bugger off if you run your outboard. 3.) You only have to worry about the first bite…. 1. Sean is a hired skipper who brings boats here and there around Australia and across various oceans. Before doing that he ran fishing charters so he also gave us good tips on how to catch barramundi (a delicious Australian fish). He also pointed out the crocs won’t be interested in your fishing pole, and even if they do, they will just snap it off before you have time to react anyways. 2. He also ran crocodile tours, so I guess he knows what he is talking about. He invited us to call when we get farther north and he will show us around the rain forests near Port Douglas where he lives when he is not off sailing. 3. He was super enthusiastic about how beautiful it is up north – and he assures us that as long as we don’t try swimming in or near any of the rivers we will be fine. The crocs apparently are “rarely” seen on beaches this time of year. (What a comfort!) This information was conveyed along with a few asides about the fact that it is now safe to swim because the deadly poisonous box jellyfish season is over. This is one strange country. For those of you who enjoy Bill Bryson’s writing, pick up a copy of “In a Sunburned Country” and read Part III which gives the most accurate and hysterically funny description of this part of Australia. 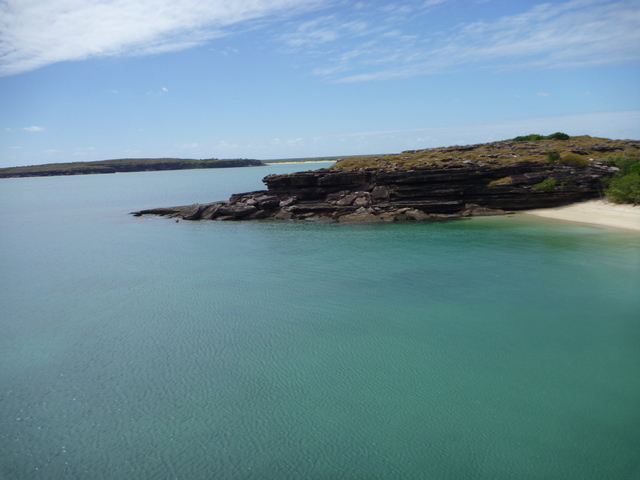 We are currently in Rosslyn Bay on the mainland – just a short sail from our previous anchorage at Great Keppel Island. We had to come over here to pick up another pump and do a bit of provisioning. The stop has been well worth it. The name of the town closest to us was worth the trip alone: “Yeppoon”. The next closest town is called “Emu Park”. You have to love this place. Tomorrow we head north another 50 miles to Pearl Bay. We put our dinghy back in the water today and paid a visit to the mostly uninhabited Great Keppel Island, which is a national park. We are already in crocodile country, which freaked us out a little bit even though they rarely come out to the offshore islands. The saltwater crocs range up to 24 feet and can be rather unfriendly. No sign of them ashore. Just a couple miles of perfect beach. 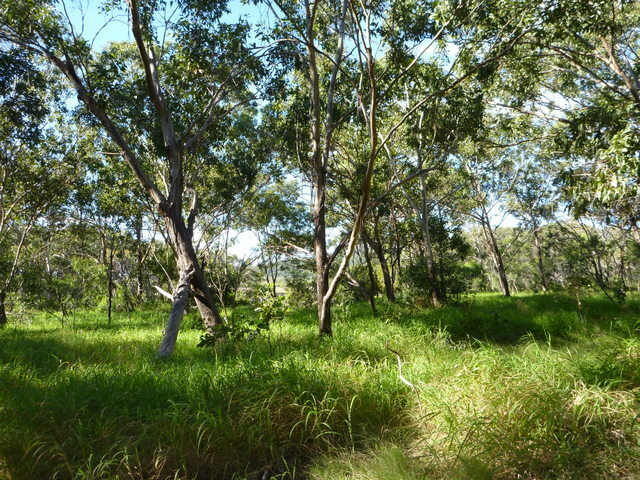 We also walked in the bush on a path, carefully looking for spider webs stretched across the way. Here are some photos of this place. 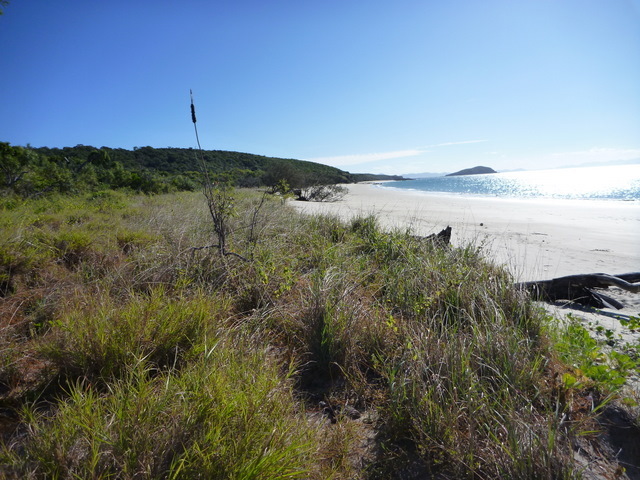 We arrived an hour ago at Great Keppel Island after a 51 hour sail from Scarborough. We had light to moderate winds the first day followed by 30+ knot winds the second day. It was a pretty good sail, although all that wind on day 2 made it a bit wearing. The occasional large wave would give Sabbatical III a good toss, making the boat roll deeply and sending anything even remotely loose knocking against whatever was next to it. During the night, whoever was off watch was protected by 6 or 8 pillows placed against the lee board of the sleeping berth. There was quite a bit of freighter traffic coming into Brisbane and Gladstone/Rockhampton, but we saw them all on our AIS display and they never came too close.M. It is Tuesday evening in Australia. Tomorrow morning we will finally start our trip up the east coast of Australia. 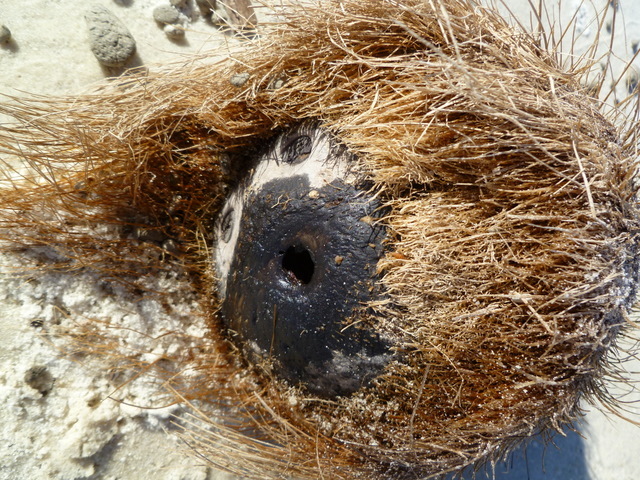 We have given up on visiting the coral atoll “Lady Musgrave” as the conditions are not right. 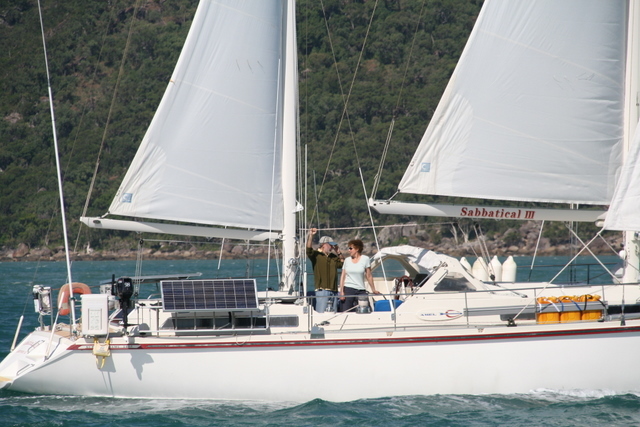 Instead, we will undertake a 340 nautical mile, two day passage to Great Keppel Island near Yeppoon. 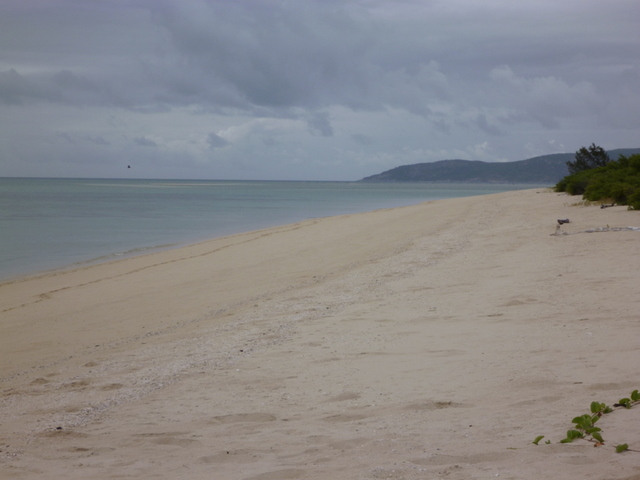 It is supposed to have great swimming and walks, and a reasonably protected anchorage (unlike Lady Musgrave). 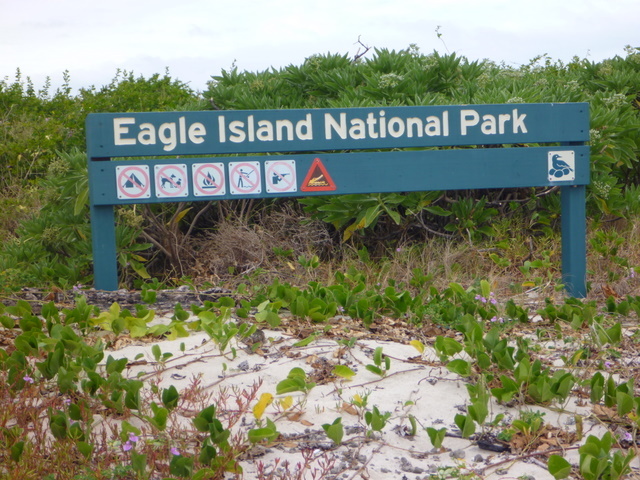 We will head to the outside of Fraser Island and then inside the Great Barrier Reef at Lady Eliot. 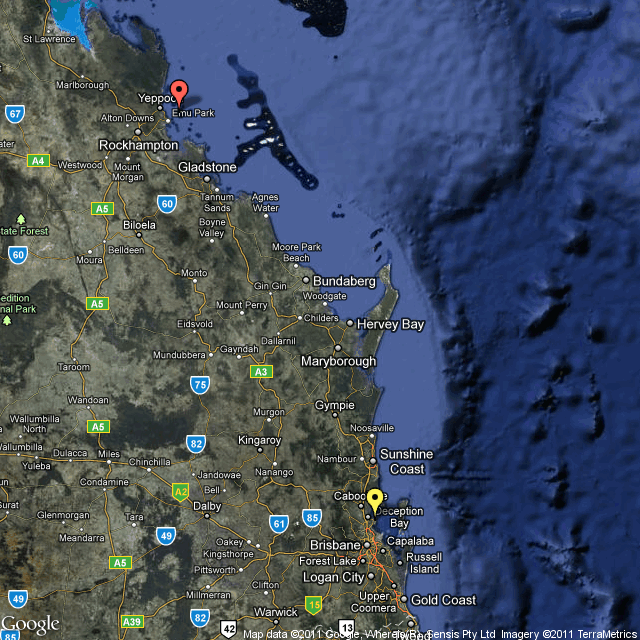 The map below shows the area from Scarborough (yellow icon) to Great Keppel Island (red icon). The map above shows the area that we will sail through during the next two months. We will go from Scarborough (Redcliffe) near Brisbane in Queenland (the yellow icon) to Darwin, in the Northern Territory, the red icon. We will cover about 4000 kilometers (2100 nautical miles). Well, I finally have time to write a blog entry. We have been in Australia for 2 weeks now, and back on the boat for all but the first two days when we stayed at a cute little B&B (while our boat was still out of the water). The boat got put into the water on Friday, the 15th of April and since then we have been working, working, working. So much to do – even after we put in so much effort last November to make sure everything was in good shape. I guess the boat just keeps aging and things start to fall apart more and more. (Kind of like us!) Since we have been back Mark has had to fix the fresh water pump, install a new flush pump for the toilet, replace the manual bilge pump, re-attach the auto-pilot, replace all the fresh water hoses, flush and clean the yucky, filthy bilge (where we found among other things a couple of long lost screwdrivers), install a new remote control for the autopilot and other instruments – then as part of just normal boat preparation we had to re-attached the back-stays, lift the mizzen boom, put up all three sails (which had been taken off for the season), change the water filters, re-insert the knot reader (speed instrument), refill the propane tanks, etc.,etc. I won’t bore you with more of this, but Mark’s list was huge, and mine was equally long ( although maybe a bit more enjoyable as most of it involved buying and storing food!) The deck of our boat looks like a tornado swept through – but we hope to get the clutter put away tomorrow, finish up our provisioning, and actually start heading north on Saturday. The weather fluctuates between beautiful and nasty – with strong winds and lots of rain in the forecast for the next few days. We are looking for a break in the bad weather to start heading north as we would like to get north to Lady Musgrave (a coral reef about 240 miles north of here) for our first stop. 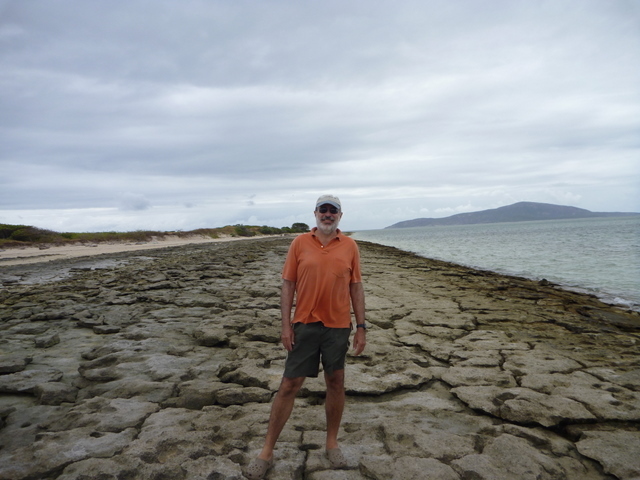 This marks the southern tip of the Great Barrier Reef which we will sail along for the next 6 weeks or so…. Guess that makes all this hard work so worthwhile. We will say good-bye to Scarborough Marina and the little town of Redcliffe where we have spent a couple of months each year since first arriving in Australia at the end of 2008. We are back in Scarborough, Queensland, Australia after a tiring set of flights from Providence. Instead of our usual two flights to get to Brisbane, we had four because of the limitations of our round-the-world airline ticket. As soon we arrived in Aukland, New Zealand we checked the monitor to see when our flight to Brisbane was leaving. We noticed that the monitor listed a flight that was already boarding and we wished we were on it since it was 3 hours until the next one. So we sat down to relax in the terminal for a while, and then i went scouting out a place for breakfast. As I came up the escalator, a uniformed flight agent was calling my name. 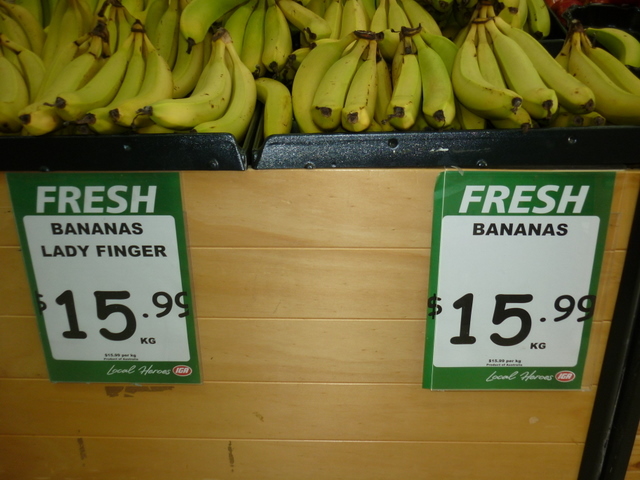 How odd I thought. It turned out that we were on the flight that was boarding, and they were looking for us. They were also calling our name on the public address system. So we ran quickly to the farthest gate to get the on the plane that they were holding for us. We both thought we had a two hour layover in Aukland and did not bother to check out boarding passes on arrival. The only silver lining on this episode is the possibility that their holding the plane allowed our baggage to get transferred. All 250 pounds of our checked baggage made it on the plane. After our bags were X-rayed, the Australian security agent asked if we had a toilet seat in one of the bags, and why we did. The answer, that we had a boat, was good enough for him. I guess that they have seen enough “yachties” to know we pack odd gear with us. 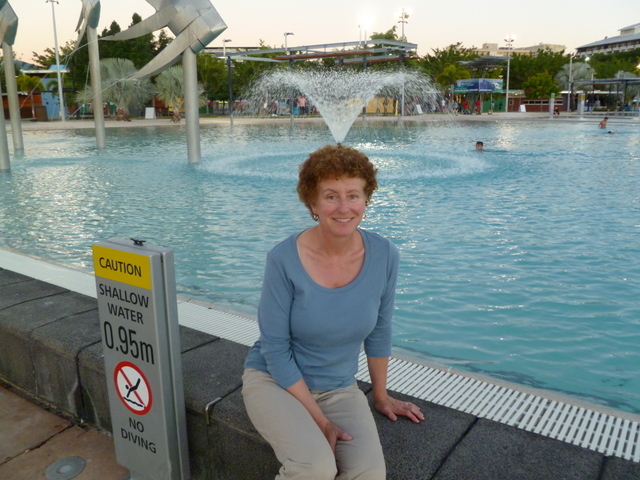 (The marine toilet seat we had cost us $16 in the US, but we were quoted $185 in Australia. Perhaps they plate them with gold in Australia). “Sabbatical III” received it’s final coats of bottom paint today, and had the prop cleaned and coated with Prop-Speed. She goes into the water tomorrow (Friday) at 4 pm. It is a good thing that we booked the boat painting and launching early since it is a crazy period in the marina. The school holidays begin next week, along with the unusual juxtaposition of Good Friday/ Easter with ANZAC Day, resulting in a five day national holiday, plus next week is the start of an important ocean race. All the Aussie boats are trying to either get ready for the holiday, or get ready for the race. Finally, we posted some new video from last years cursing season on our web site. Go to our home page at http://www.sabbatical3.net and click on the new video link.